In COG world, there are many kinds of quests leading adventurers to explore the Masure Mainland. Main quests will lead adventurers to explore every town or city, and make adventurers realize the core of COG world. With the main quests developing, the game’s plot will show to everyone step by step. What truths are hidden in the Masure Mainland? Main quests will guide you to discover them. Side quests will provide adventurers unprecedented richness. The side quests in Aldia Harbor will introduce some systems and features of the game. With the plot developing, more and more side quests will give you better rewards. Do you want quick level up? Do you want to put on better equipments? Don’t give up these quests. Reward quests are daily quests. You can receive the 10 times at most. Reward quests can be received in the Level 30 City: Palace of God. Each time adventurers can receive only one rewards time. When you finish it, you can receive another one. The rewards of these quests are better than any other quests’. Reward quest’s sign is a blue exclamation mark. 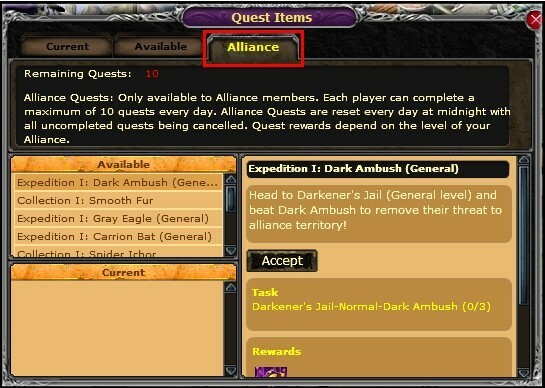 Alliance quests divide into killing monsters and collecting materials. When you join in an alliance, you can see them on the screen. 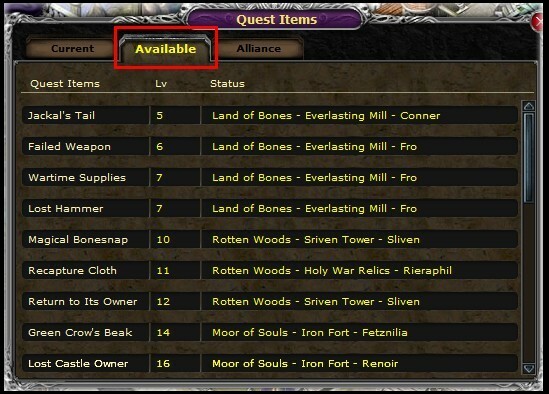 How to accept quests quickly? You can see all quests you can accept in the “Available” screen.